Jacoby Jones made the Pro Bowl as the game’s top kick returner in 2012. He returned two kickoffs for TDs, a punt for a TD, and another kick return TD in the Super Bowl that only Usain Bolt might have been able to catch him on. His 30.7 yards per kickoff return ranked third in the NFL behind Percy Harvin (35.9) and Trindon Holliday (32.5). One of the bigger questions I’m surprised isn’t getting as much attention is what will Jacoby Jones role be on special teams? This season is a contract year for Jacoby Jones. He also has an opportunity to be a larger part of the passing game with the departure of Anquan Boldin. We learned at the “Liar’s Luncheon” prior to the draft, that the Ravens are excited about some of the young talent who may have a chance to return some kicks this year. That’s great, but is it wise to move last season’s top kick returner out of that role? I have alluded to the fact previously that Jones stands to make more money should he test free agency in 2014 if his agent can sell him as a great number two receiver who can also return kicks, rather than a kick returner who can run some 9-routes if you need him to. 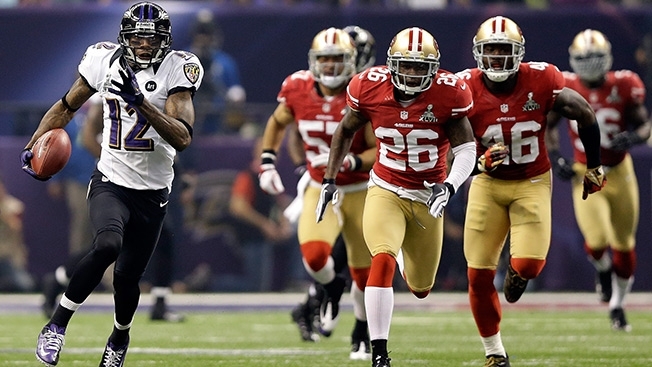 Will the Ravens give Jacoby Jones that chance to prove he’s more than just one trick pony? If the Ravens are truthful and Jones’ focus will be on playing WR, then who will take his spot on kick return? David Reed – The early favorite in my opinion. The Ravens love what he has done on special teams after losing his job following two fumbles in the Seattle game in 2011. There is a reason they signed him this year. In 2010 he averaged 29.3 yards per return, with a 103 yarder for a TD. In 2011, Reed averaged 29.7 YPR. Laquan Williams – If given a shot this preseason, it may be his only chance of making the team. In 2011, given five kick return attempts, he averaged 21.8 per. Deonte Thompson – It didn’t seem like it, but Thompson got 15 return attempts last year. He notched 25.9 yards per, and a long of 49 yards. Anthony Allen – Three attempts, 18.7 per return. Not a likely candidate, but he’s done it before. Tandon Doss – The only one of the group with punt return experience. He returned four last year with 13.3 yards per return. That average may be skewed a bit since that includes one 40 yard return. Asa Jackson – Had himself an 85 yard punt return for a TD in the 2012 preseason. However the play was called back by a holding penalty. So the potential is there. Jackson of course will serve a suspension during the first four games of the season.